When the Pig family decides to go to the beach they see every kind of vehicle on their way. 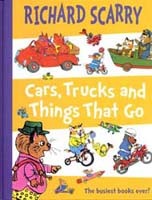 From hot-dog cars to bug buses and mouse beach buggies to pumpkin cars. Join the Pig family on their eventful journey, and keep a look out for Goldbug on the way. This book is the perfect introduction to everything that moves.